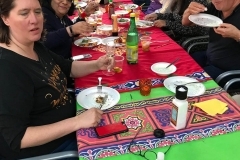 Founded in 2015, as a place for women in Basel, Switzerland and the surrounding areas including the close by areas of France and Germany to make new friends, discover unknown talents and raise money for charities. On Sunday 27th January we met for our AGM combined with a lovely Sunday Brunch. We said goodbye to the outgoing committee and welcomed the new. We have lots of ideas and made some plans for 2019. Learn more about the IWI Basel and become a member! Sign-up & participate in our next Spring Charity Bake-Off – Sunday 19th May 2019. Our second Bake-Off of the year will take place on 21st October 2018 at Markthalle in Basel. Non-members are welcome to participate. Our chosen charity for this Bake-Off is the Surprise Strassenchor and 50% of the proceeds go to support this incredible charity. This is a ‘fun’ event and all you eager amateur bakers (sweet-bakes only please) – both IWI and non-members are welcome to enter! There are ‘prizes’ and certificates for 1st, 2nd & 3rd placed winners. Judging starts at 10:30 and all sweet bakes are for sale from 11:00 to 15:00. Home-made savoury bakes are on sale from 10:30 – Go on, treat yourself! To celebrate the warmer weather (well we never need an excuse to get together). 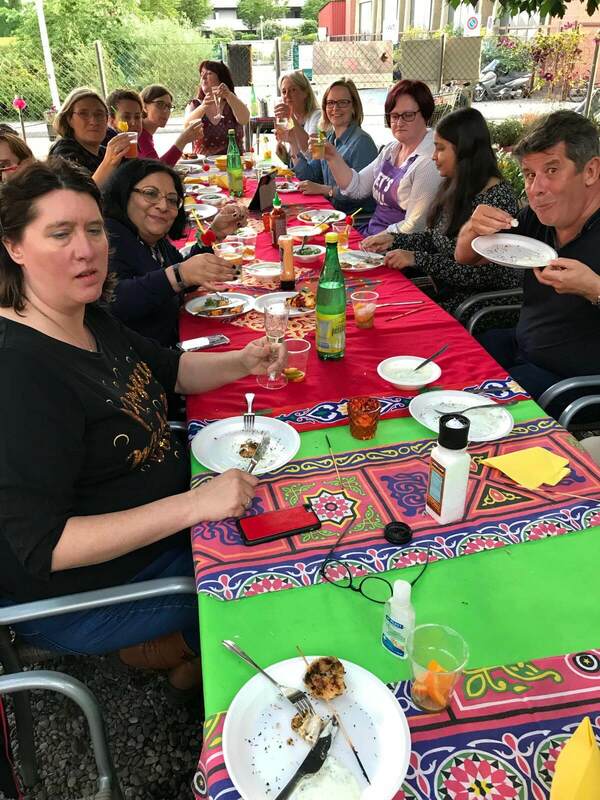 The IWI Basel met for a wonderful BBQ evening. We had wonderful food – Jerk chicken, garlic grilled plantain, coconut prawn skewers, mango salsa and banana and pineapple skewers served with ice cream. And we cannot forget the fabulous rum punch! 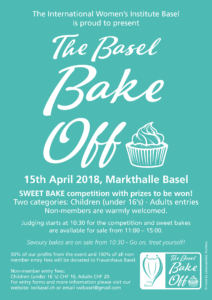 The Bake Off is a baking competition where our finest home-baked goods go under the scrutiny of our judges to decide who is the top baker in Basel! We sell portions of the entries to raise money as well as selling other savoury baked goods. We will raffle off luxury hampers containing food, drink, and gifts to three lucky winners and also sell handmade crafts.